The cars for both Halloween and Holidays deck out Radiator Springs. Cars Land is always a great area for toddlers since 2 out of the 3 rides they can go on, and its such an immersive land! I highly recommend checking out Cars Land in the evening, so you can see the lights on throughout the land. Each store, ride, and restaurant has specially themed decorations, making it easy to always spot some new detail everytime you go! Meeting Santa Claus at Disneyland is a very special experience since each place you meet him is beautifully decorated, and the Santa’s always look like they came straight out of a storybook! You can find Santa at Disney California Adventure in the Redwood Creek Challenge Trail and in Critter Country at Disneyland. He also does meet-and-greets in the lobby of Grand Californian Hotel and at Disneyland Hotel. If you want a more woodsy traditional look to your Santa photos, I would go to visit him at one of these places. My personal favorite place to meet Santa at Disneyland Resort is at Disneyland Hotel near the grand ballroom, since the line tends to be the shortest, and the meet-and-greet area is designed to look like a 1960’s mod living room! Another area with a shorter line is in the lobby of Paradise Pier Hotel (the set-up is a little more basic, but you can’t beat a short line!) You can find the Santa meet-and-greet times each day on the Disneyland app. The Christmas Fantasy Parade is my absolute favorite Disneyland parade! Once you hear the toy soldiers marching down Main Street, and see the reindeer dance in front of Santa’s sleigh, it officially feels like Christmas time! The parade happens daily at 3:30pm and 6pm. It can get crowded, so I recommend getting a seat about 50 minutes ahead of time. My favorite spot with toddlers is in front of the Main Street U.S.A. fire station, since it’s a spot where (1) you don’t have to worry about people squeezing in front of you and blocking your little’s view, and (2) it’s an easy spot for characters in the parade to interact with your little for an extra special experience! If you’re little one isn’t a fan of waiting and can’t get a prime spot ahead of time, then my last minute parade spot recommendation is on the top of the stairs on the platform that’s in-between Small World and Matterhorn. While you are further away from the floats, you can get a good view of them! 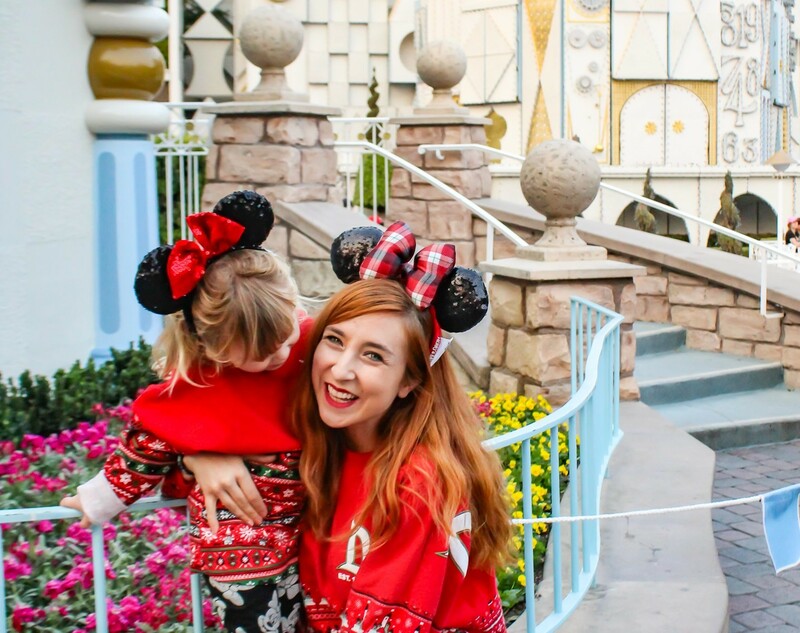 Top of my list is mine and my daughter’s favorite Holidays at Disneyland Resort tradition: It’s a Small World Holiday! Disneyland Resort is the only park that does a holiday overlay on it’s a Small World, so it’s an extra special experience. The inside is completely decked out with holiday scenes from different cultures, including a new one this year themed to The Nutcracker. Outside each night at 5:15, the Small World clock is wearing a Santa hat, and at sundown Small World lights up. Even if you’ve seen the Small World lights each year, it still always blows me away! There’s even a special holiday light show on the front of it’s a Small World at 5:30, 6, 6:30, 7, and 7:30. If your little one gets scared of fireworks, seeing this nighttime show is a great alternative! To start planning your trip to Disneyland Resort during the holidays, you can check out some amazing deals on Disneyland tickets and Disneyland vacation layaway plans by visiting here.